I’m always looking for more delicious ways to eat fish. 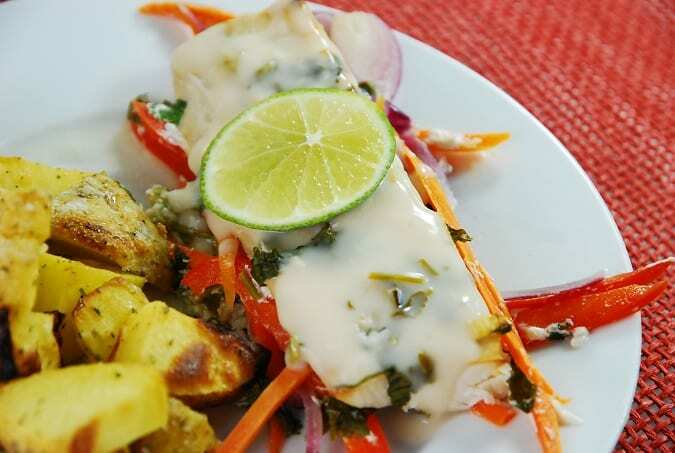 And this Thai-Style Baked Mahi Mahi Recipe offers a wonderfully flavored, delicate white fish served a top roasted vegetables and smothered with a creamy coconut lime sauce. It was a dish that was not only colorful and beautiful, but very fresh and tasty. Light and delicate, yet satiating, my husband and I loved this low calorie fish recipe. Cooking it in the sealed foil helps keep it moist and tender, and helps the essence of the coconut lime sauce penetrate the vegetables as well as the mahi mahi. This Thai-Style Baked Mahi Mahi is truly a satisfying Weight Watchers fish recipe. Juicy and delicious, this Thai-style Mahi Mahi is a wonderfully flavorful meal that presents beautifully and is low in Weight Watchers Points. Fresh roasted vegetables are the perfect complement to the tender fish, and it’s all topped with a bright and fragrant coconut sauce. In a large bowl, combine the coconut milk, lime juice, fish sauce, jalapeno, ginger, garlic, cilantro and Thai basil. Add the fish, turn to coat, cover, and refrigerate for 30 minutes to 1 hour. Remove fish, and reserve marinade. Preheat oven to 425. Spray a large, rimmed baking sheet with nonfat cooking spray. Toss vegetables in marinade. Remove them, and place them on the baking sheet. Roast in the oven for about 15 minutes, or until vegetables begin to brown. Lower oven heat to 325. Cut 4 large pieces of aluminum foil. In the center of each piece of foil, place 1/4 of the vegetables, top with 1 portion fish, 1 tbsp of marinade and 1 slice fresh lime and fold the foil around the fish and vegetables like a package. Place on a baking sheet and cook for about 15-18 minutes. Pour remaining marinade into a small saucepan, and set over medium high heat. Whisk constantly and allow to reduce. Sauce should thicken a bit. Remove the packets to individual serving plates. Serve each piece of fish with prepared sauce and fresh lime slice. I have a question – is it safe to put the vegetables in the marinade the raw fish was in?